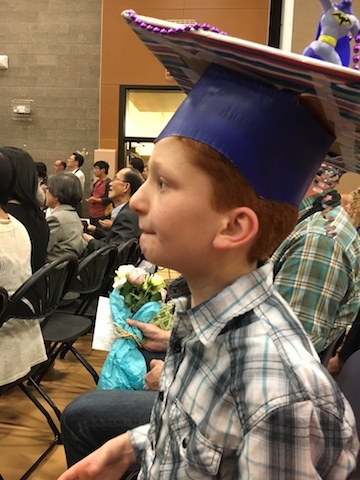 Yesterday, Nate graduated from elementary school. As of today, he is officially a middle schooler. My brain is swimming in an emotion-laden mixture of pride, joy, fear, excitement, anticipation, relief and anxiety, and I’m eager to face the next phase of Nate’s schooling together as a family. I’m also grieving the loss of a special school community that supported, encouraged, tolerated, cared for and loved my children since they were still chubby-cheeked and wide-eyed little boys. This school was where my older son made his life-long best friends, where I met my neighbors and fellow moms, and where Nate, fully included in a general-education setting, became just one of the kids. Our trek towards Nate’s inclusion started with many obstacles, the first of which was my own doubt that it was possible. I was pretty sure Nate’s behaviors were too challenging, his vocal outbursts too disruptive, his learning needs too great, his disabilities too complicated. I didn’t want to be called every day with complaints about how disruptive he was. I wanted him surrounded by teachers and staff who were experts in how to best support him. I started by doing some research and learned that children with behavior challenges are likely to show behavior improvement when surrounded by typically developing kids, and also that every school in our district has access to the same level of special education expertise as the self-contained classroom located at a school across town. I also learned that attending his neighborhood school is Nate’s right, and the place for him to be if I wanted him to be as much a part of the surrounding community as his older brother was. It didn’t take long for me to conclude that inclusion was a great, albeit scary, option for Nate. It didn’t take long for me to conclude that inclusion was a great, albeit scary, option for Nate. The next obstacle was convincing my husband that inclusion was the best fit. He had significant fears that Nate couldn’t be kept safe in a general-education setting, and that he would be a non-stop target of playground bullies. We kept asking questions and learned that in Nate’s case he would need a full-time 1-on-1 aide who would be watching him at all times, keeping him safe and happy all day long. It took a lot of talking and persuading, but eventually Nate’s dad was on board. They thought the Speech Therapy room was too far from the kindergarten classrooms and the walk would take up too much of his day. They thought the rigors of Kindergarten would be too hard, and that Nate wouldn’t be able to be successful. They urged me to wait another year. Knowing in my heart that their concerns were legitimate made advocating hard, but I stood my ground. “He deserves to have a chance to prove if he can do it,” I said to a room full of professionals. “Give him the chance he deserves.” They were skeptical, but they took the leap. That was 6 years ago, and Nate did exactly what I’d hoped: He proved he could do it. He could (mostly) behave for short periods of time in a regular classroom. He could (usually) hold back his vocal outbursts. He could spend at least half of every day with his typical peers. He could make friends, play safely at recess, and participate in class discussions and group projects, all while continuing to slowly but surely meet his IEP goals. Of course, none of those successes happened on its own. Nate spent six years surrounded by dedicated and skilled teachers, devoted para-educators, generous administrators, kind and good-hearted children and parents, and an entire community committed to making it work. Nate proved he could do it, but so did his school. Nate proved he could do it, but so did his school. Elementary school was not without its challenges. Nate’s difficult behaviors never went away, and in some cases have increased as he’s gotten older. His ability to access the curriculum that his peers are using gets harder every year. The gaps in social and academic skills between him and his classmates keep widening, and play date and birthday party invitations have dwindled. He was hurt by another student on the bus because of his language delays. He’s grown shyer and a little more withdrawn as time has passed. Through it all, though, Nate was embraced and loved. After their initial hesitation, Nate’s team never once expressed that perhaps he’d be better off in the self-contained program. He was a kid in the school and he was wanted there. He gets greeted when we’re at the grocery store, he has someone to sit with on the bus, and he beams with pride when we drive past his school. We succeeded at making Nate an irreplaceable member of his community, and that is the best success I could have hoped for. Next year, we have decided to go in a different direction. Nate will be attending a middle school program specifically designed for students with developmental disabilities. He’ll spend a little more than half of his day in a special education classroom, and will spend the rest of the time attending general education classes. We made this choice for many reasons, but it wasn’t an easy decision. 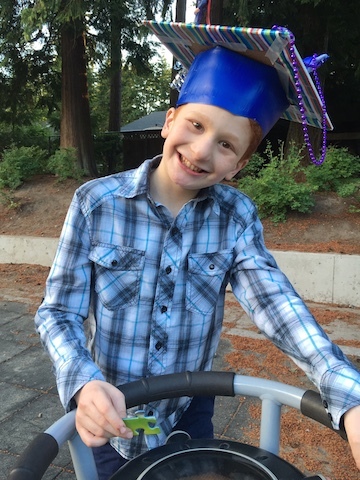 Our priority to keep Nate as a vital, necessary member of his school and community still remains, but we also want to make sure he has a chance to get to know other children with disabilities. They are his peers, too, and we’re excited to get to know a new group of classmates and families. We will never forget the immeasurable gifts we have received from Nate’s school. Graduation day was a poignant reminder of the 10 incredible years we’ve spent as a member of this community, and my tears are a testament to my gratitude and treasured memories. It never feels like the right time to say goodbye, but it is time to move on.